Plain Jane has never looked so good! 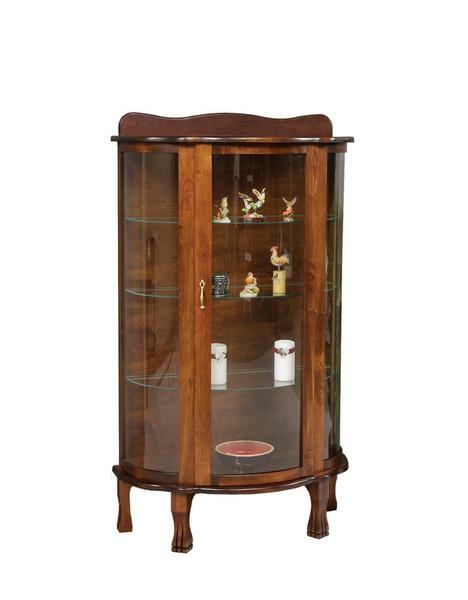 This Amish Curio Cabinet is a tall drink of water, sure to elongate any space to make it appear larger. We love the simplicity of its design, allowing you to pair it with a variety of different decors. No matter how your space is decorated currently, this curio cabinet is sure to blend in flawlessly. The look may be simple, but our curio cabinet is of heirloom quality and offers many great standard features to benefit your home. Its curved glass door creates depth, and 3 adjustable shelves with plate grooves will allow you to create a custom look depending on what you decide to display. Add something extra to your new curio cabinet by choosing custom hardware. We also offer the option for wood shelves as well as a mirror back. Consider a tongue and groove shiplap back for an even more unique look. Feel free to give us a call so we can answer any of your questions about our Amish furniture. We'd love to discuss the option for a keyhole lock and many other possibilities for our Amish Curio Cabinet: 866-272-6773. You can also stop by our brick and mortar furniture store in Sarasota, Florida.